Mumbai : Chinmaya Mission has dedicated the upcoming year to a celebration of spirituality and its various nuances. Chinmaya Ananda Utsav from December 13 to 20 is a part of the year long celebrations. Chinmaya Ananda Utsav begins with ‘Spirit of India’ organized by Chinmaya Mission Mumbai as a musical evening on December 13 2015 at the Sri Shanmukhananda Chandrasekarendra Saraswati Auditorium. It serves to be a significant occasion that brings together youth, corporates, industrialists devout acharyas, members and trustees of various Chinmaya Mission Trusts, and the who’s who of India’s business world who are fervent followers of the mission. 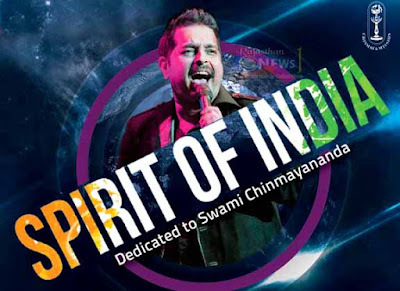 Spirit of India, is a perfect kick start to 2015’s mega event Chinmaya Ananda Utsav, features a charity concert by renowned Bollywood singer Shankar Mahadevan along with a film about Chinmaya Pradeep – A Permanent Outdoor Vision Park coming up in Powai and some key announcements for celebrations in store in the coming year. The concert is dedicated to Swami Chinmayananda. As an evening full of soul enriching music, Shankar and his troupe will be presenting a blend of pop bhajans, patriotic numbers, traditional chants strung along modern tunes. Spirit of India is a charity concert aimed to raise funds for conducting FREE workshops on “Transforming Indians to Transform India” in schools and colleges for students from 6th standard till graduation. 900 workshops have already been conducted impacting about 60,000 students. The proceeds will also be used to offer Chinmaya Transformation Scholarships to deserving students for education and also towards the Jalyukt Shivar Abhiyaan for Farmer’s relief in Maharashtra. “Swami Chinmayananda was a true patriot who worked for the betterment of his country and people through the knowledge of Vedanta. With Spirit of India, a musical charitable evening, we wish to re-invigorate the cultural and national spirit of India he firmly believed in – a spirit that can transform the core of every person and inculcate the will to place ‘Nation before self’,” said Swami Swatmananda Acharya, Chinmaya Mission Mumbai.